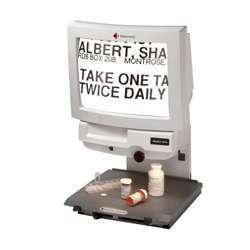 The Aladdin Ultra video magnifier's large 17-inch screen makes reading easy at any magnification and can display complete columns of text. Turn on the Aladdin Ultra and begin your day with the morning newspaper. Check stock values, read TV listings or work your crossword puzzles. Take care of business by writing checks and filling out forms. View medicine bottles and package labels with complete clarity. The Ultra can also help you with crafts and fix-it projects. You will enjoy using your Aladdin Ultra because it is designed for comfort and simplicity. There are just three ergonomically placed, smooth operating controls, and the monitor adjusts for perfect placement. Additionally, with the Feather Touch� reading tray featuring a smooth, non-glare finish you can effortlessly position your material and smoothly move it as you read.